Event Description : THEATRE : Reader’s Digest Chronicles 'Celebrate Storytelling' LIVE! 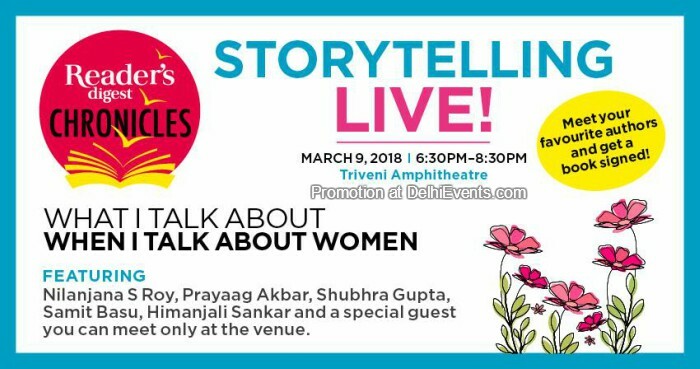 Come, listen to captivating storytellers on one live platform brought to you by Reader’s Digest magazine. No discussions or deliberations, just your favourite author telling you a story. Untold narratives, and counternarratives, of women—their power, resistance, love and loss. All in the magical Triveni Amphitheatre where spring is in full bloom. A special guest whom you can meet only at the venue.